This simple, no frills and allows your child to try many commands independently and see what happens. 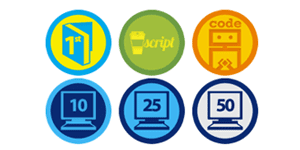 At higher levels, they even offer a certification course for just $95. A great way to see real live changes on any website in real time by using the Google Chrome browser plug-in Inspect Element. Another compelling reason to switch to Google Chrome, our primary browser right now.